The Goomalling, Dowerin, Wyalkatchem and Toodyay Skeleton Weed Local Action Group works towards eradicating skeleton weed in our region. What is skeleton weed and why is it such a serious weed? Skeleton weed is a declared weed that can decimate crop yields. It is extremely competitive and invasive and its wirey stems and sticky sap can block and tangle machinery. It can also render pasture paddocks unviable. 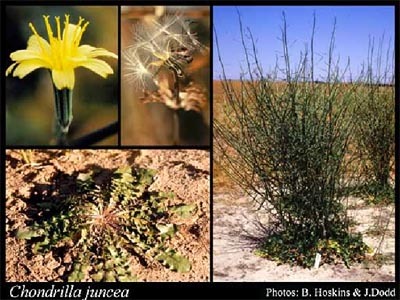 See Skeleton weed (Chondrilla juncea) - control in Western Australia for pictures and more information. What happens if skeleton weed is found? The process below explains what happens. Goomalling's local Biosecurity Officer is Paul Manera, mobile 0429 203 327. If the paddock has had no skeleton weed infestations before you need to contact your local Biosecurity Officer. The paddock will require a full search. Stock need to be off the paddock for up to 6 weeks prior to searching. A 20m buffer from the plants needs to be created to form a square. The square will then be GPS’d for winter spray treatment. The Department of Agriculture will reimburse the costs of searching code 1 paddock only. The plants will need to be controlled (spray or cut) in the summer to prevent viable seed set. If your paddock was a code 1 last season it will start as a code 1 for this season. After a full search in the summer, if the search was clear the paddock will become code 2. This paddock had a clear search in the previous season. This paddock requires surveillance or full search if you prefer. Stock need to be off paddock for up to 6 weeks prior to searching. If plants found it has now become a re-infested code 1 paddock which requires a full search as above (NOTE a re-infested paddock does not qualify for payment from the Department of Agriculture & Food, this will apply the following season). If no plants have been found then the paddock status will change to a code 3. This paddock has had 2 clear searches. This paddock requires a full search. Stock will need to be off the paddock for up to 6 weeks prior to searching. If no plants are found, you need to immediately contact your local Biosecurity Officer. They will conduct an audit of the paddock and if cleared the paddock will be released off the infested list. The paddock is now a code 4. The paddock has been released off the infested list. If new plants have been found in the paddock it will return to a code 1 (new find) and you need to contact your local Biosecurity Officer. The Department of Agriculture & Food will reimburse for the searching. This paddock is adjacent to the code 1 paddock and requires a surveillance search. If plants are found this paddock (new find), then the paddock becomes a code 1 paddock. A paddock requires 3 clear searches before it can be released off the infested list. Remember if in doubt contact Goomalling's local Biosecurity Officer Paul Manera on mobile 0429 203 327. With funding assistance from the State Skeleton Weed Committee, local action groups such as the Goomalling, Dowerin, Wyalkatchem and Toodyay Action Group are set up to promote awareness of skeleton weed, because the more people who are aware of what it is and what it looks like, the better we can all stop the spread. That is why the Goomalling, Dowerin, Wyalkatchem & Toodyay LAG wishes to help fund your event, as it is seen as one of the best ways to create awareness. For further information please contact a member of our committee.